Ever have one of those days where your creations come out like "This is what your brain looks like on drugs!" Well, that's how I'm feeling right about now and I'm wondering about this card....not sure what I was doing here. I really shouldn't create when I'm tired because my cards come out kinda weird and they nevah grow on me!! I'm contemplating who I should give this card to....maybe one of my kiddos teacher---nah, how about one of my neighbors?? Yes, I know which neighbor will receive this beauty ROFLOL. I'm not crazy peeps, just tired so I'm going to take a rest but I'll be back with a couple more creations that are more to my liking. Thanks for stopping by and *see* you again soon!! Jackie, your card commentary is too funny!!!! I love this card!!! Great colors and layout with great detailing!!!! TFS!!!! Well, I really like your card, and love your post!!! Nothing wrong with your brain or your card! Very pretty....brain works great, Jackie! This card is so pretty! I love all of the elements you added to the card. It looks like it took you awhile to make! Beautiful work! Jackie...you crack me up!!! I love your Christmas card...the colors are gorgeous and I love the layout!!! Love how you did the ribbon, too!!! Apparently I don't see what you see cause I think this one is really cute! This is a great card. Love the colors and your layout it fantastic. I didn't know you had a blog. So glad I know now. 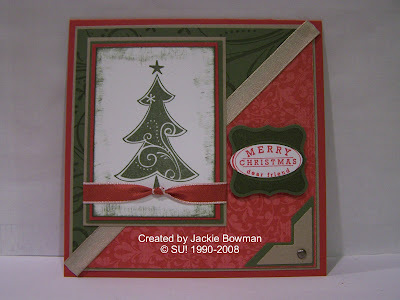 Incredible Christmas card Jackie! Wow, you've always made great cards.